Indexed in: Scopus, Chemical Abstracts, EBSCO. In the early 90’s, gene therapists were beginning to get their heads around the concept of targeted delivery as a means to improve safety and efficacy of gene therapy. Retroviral vectors were, at that time, the most promising vehicles for gene delivery, having been successfully used in the first clinical trials. Naturally, the targeting of retroviral vectors was at the forefront of research, in particular at the level of infection as pointed out in one of the first reviews on this area written by Walter Gunzburg and myself and appearing in Human Gene Therapy. Although an important new concept at the time, it all turned out to be a lot more complicated from today’s standpoint. 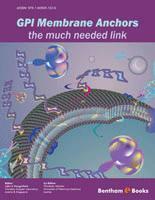 Fast forward to today, and we have a book edited by John and former student and colleague Christoph Metzner, about GPI membrane anchors, a molecular tag that helps insert proteins into the plasma membrane of cells and not just anywhere but in so called lipid rafts, agglomerations or islands of lipid that float in the plasma membrane. The book covers a wide variety of aspects of GPI anchors, what they are, their structure, how they function, what roles they carry out, how they can be used as a tool in biotechnology and how similar GPI-like molecules can be created by molecular mimicry. John and Christoph have selected some of the world’s foremost authorities on GPI anchors to contribute chapters to this book. These highly skilled authors provide not only reviews of the knowledge that has been gained about GPI anchors over the last decade or two but also protocols on how to isolate and modify such molecules. Thus the book can be viewed as a nuts and bolts engineering manual and cook book – a kind of “all you ever wanted to know” guide. All in all, the authors have made excellent selections showcasing various facets of current GPI research and shown remarkable editorial skills as well as contributing significant progress themselves to this field. So why start this foreword with ruminations about the targeting of enveloped viruses like retroviruses? Well GPI anchors offer a solution for the insertion of all kinds of proteins into the plasma membrane not only of cells but also of enveloped viruses and that offers a means to attach ATP motors, magnetic particles and almost any other nanomolecule. This technology, which has been termed “virus painting”, but can also be viewed as a type of decorating or coating of enveloped virions, holds much promise for the targeting of safer virus vectors and vaccines as well as having uses in the diagnosis of well-known and emerging virus diseases. Developing technologies over the best part of the last 40 years have allowed scientists to continually re-address the way cholesterol-rich cell membrane microdomains, or lipid rafts, and their protein components are analysed. More recently this accumulated knowledge has started to take shape into substantial structures of understanding. The focus of this work is on glycosylphosphatidylinositol (GPI)-anchored proteins (GPI-AP) as a major component of lipid rafts. As a special feature, detailed lab-protocols are helpfully integrated into the text in order to allow the replication of state-of-the-art experiments. The first 2 chapters are of an introductory nature. Firstly, Vera Michel and co-authors review the biological relevance of lipid rafts, what their absence can mean in terms of pathologies and introduce them as "the home of GPI-AP" whereas Barbara Viljetić and co-authors then go into more detail on the basics of GPI-AP. This second chapter has an interesting focus on the mechanisms and reasons for different types of protein release, both with and without their GPI-anchor, as well as their uptake and effect on surrounding cells. Taken together, they give a sound foundation of understanding before going onto the subsequent chapters. In chapter 3, Frances Sharom gives her interesting insight on the biophysics of the way membranes, GPI-proteins, their anchors and cutting enzymes influence each other, with important implications for function of GPI-AP and their releasing enzymes. In chapter 4, Miren Omaetxebarria and co-authors have a strong technical focus as they take a proteomics approach to analysing GPI-AP, which is rounded up with a look at the bioinformatics aspect. This includes information of the analysis of proteins, anchors (glycans) and the definition of GPI-anchor attachment or omega-sites. Taking another turn in chapter 5, Martin Lear and co-authors introduce the chemistry of GPIs. Natural GPI-anchors are diverse in structure and yields from cells are low, so the chemical synthesis of GPI-mimics is interesting and may be crucial for up-scaling for multiple applications. This synthetic approach discusses far reaching aspects of the topic and is presented in a way that is accessible for the biological audience. Finally, in chapter 6, the editors, together with Daniel Legler, show that cells, viruses and other biomembrane-encompassed particles can be decorated on their surface with GPI-AP, a process known as "GPI painting" which does not require any genetic manipulation of the modified entities. They further discuss the already emerging applications for this technology. Aside from addressing the potential that GPI-AP have in perspective of today's developing biomedical and biotechnological scene, one of the aims of this book is to draw together the various scientific disciplines within which GPI-AP and related topics are being researched. Each discipline can of course be justified in its own right; however, by enabling a common level of understanding, novelties may be revealed that allow extraordinary progress to be made.